I found this cup recently for $1 at a local consignment shop. I assume that it had a saucer at one time. It has no chips or cracks. Very slight loss of gold trim around the top rim. This is the back side of the cup. This is the only marking "made in England". It has some fluting. 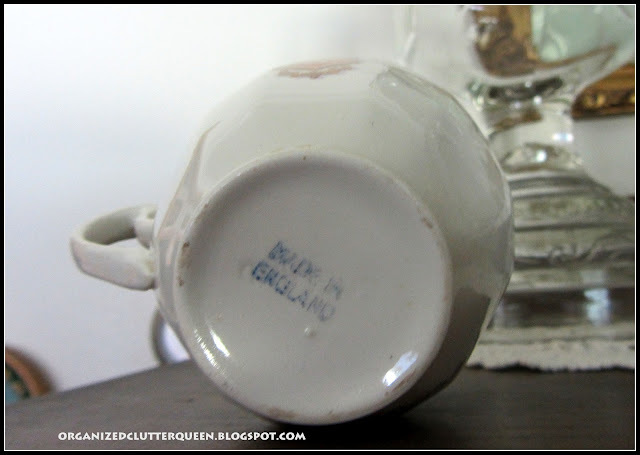 Do any of you tea cup collector's have any information on the age or maker of this tea cup? Also do you know where I may find a saucer? Is the cup rare or easily available? 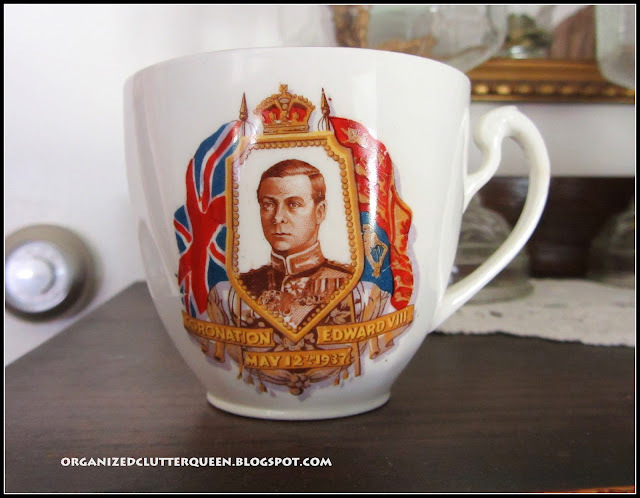 Thanks for looking at my Edward VIII coronation commemorative cup! I don't have any answers for you, but what a great fine! I found a few different ones listed on ebay and some on etsy as well. None were exactly like yours. Most had dessert plates to go with them. Cups alone were priced at $35 to $45. Judging by the comment above, you hit the jackpot! might be able to help you out with the history of it. You have some wonderful collections. I like the cloche with little bibles under it. Thank you for your visit and I hope you having a lovely weekend. I do indeed! That's Edward VIII made for his coronation in 1937...which never happened because he abdicated to marry an American divorcee, Wallis Simpson. 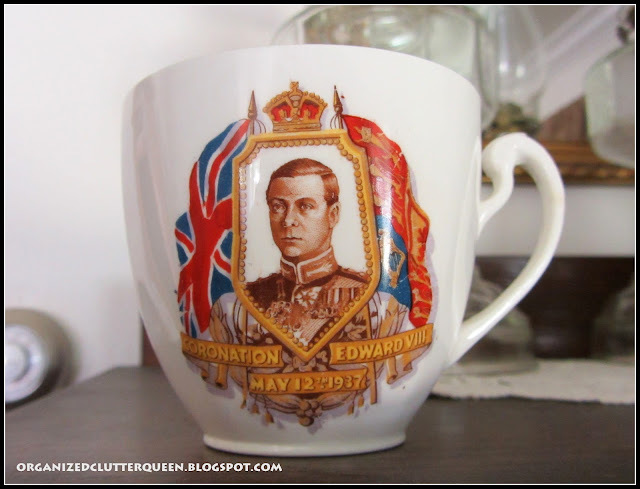 His brother became king instead, George VI, who is Queen Elizabeth II's father, This is the king that the King's Speech starring Colin Firth was made about. You ought to get it a see it if you haven't. Great historical find! Thanks for sharing & linking to Tuesday Cuppa Tea! It was interesting reading about and seeing your cup. Great find! What a great find! I have a friend who collects English commemorative china. Unfortunately, that's all I know about commemoratives! Happy Tea Day! 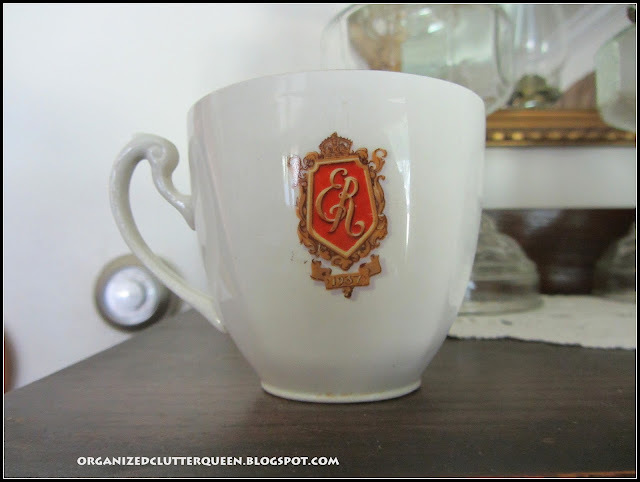 I am afraind i don't know anything about this teacup or maker but, it sure is a fun find! Once you knew the maker you might be able to go to Replacements.com and look for the matching saucer.